The Dental Practice Exchange website offers brokers, attorneys, CPA's and financial institutions that operate in the Dental practice M&A market the opportunity to connect with there target audience. What is the State Banner advertising package? Our State banner advertising packages ensure your business gets specific exposure to the States that your operate within. What prices do you charge for the State Banner package? Two banners are available - one at the top of page, and another on the right side of the page. In addition to this each State has one 'Featured Broker' position. Where exactly do the banners appear with the State package? So, for example, for just $30 a month I can purchase the top page banner for my State (Hawaii) and my business will gain coverage on the 3 specific pages relating to Hawaii? I am interested but need help designing a suitable banner? No problem, we can work with you to create a suitable banner, or alternatively can recommend a very reasonably priced graphic designer who will be able to create a banner for you for a one off fee of $100. What are the banner sizes? The top page banner is 468 pixels wide by 60 pixels high. The right page banner is 165 pixels wide by 280 pixels high. I'm interested and want to hear more? 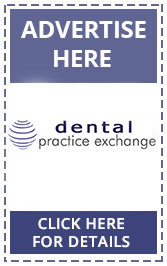 Then drop an email to accounts@dentalpracticeexchange.com with details of the State package you are interested in. What is the 'Primary Site Sponsorship' opportunity? Two banners are available on the Home page and all Main Menu pages. Advertisers gain considerable exposure to traffic that enters the site through the home page and other main sections of the site (Find a Broker, Opportunities/Wanted, Practices For Sale pages).